It's hard work, taking care of 5 little ducks. But when each little duck comes home with a friend -- oh, no! Now it's double the ducks and double the work. How can 1 little boy get everything done? 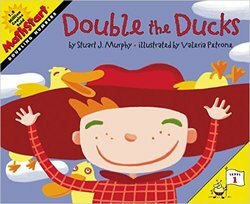 Understanding how to double numbers helps children master both addition and multiplication. Fun, friendship, and lots of ducks make learning this essential skill both easy and entertaining.